Be the first to share your favorite memory, photo or story of Emma. This memorial page is dedicated for family, friends and future generations to celebrate the life of their loved one. 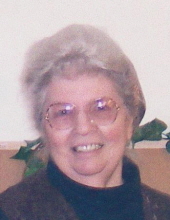 Emma Jane Ryan age 88 of Webb City, Missouri passed away on Wednesday, May 9, 2018 at her home. She was born on August 22, 1929 in Shelton, Missouri to Oscar Allen and Clara (Carr) Allen. She was a homemaker and a member of the Jesus Name Gospel Church in Oronogo that she and her husband founded in 2000 and also pastored. She married Victor Ryan on December 23, 1944 and he preceded her in death on November 27, 2009. Emma is survived by her sons, James Ryan of Neosho, Missouri, Dan Ryan and wife Dixie of Carterville, Missouri, Tim Ryan and wife Uldine of Carthage, Missouri, Roy Ryan and wife Terri of Ava, Missouri, Tom Ryan and wife Pat of Joplin, Missouri, Nathan Ryan of Mobile, Alabama, Phillip Ryan and wife Donna of Jasper, Missouri; daughters, Mary Forsythe and husband Jerry of Carterville, Missouri, Joanna Sparlin and husband Darrell of Oronogo, Missouri; 27 grandchildren, 52 great grandchildren, and 15 great great grandchildren. She was preceded in death by a son, John Ryan; a daughter, Catherine Ryan; grandson, Thomas Ryan, Jr.; great granddaughter, Shelby Ball; a sister, Sarah Mansfield; and a brother, William Allen. The family will be present for a visitation on Wednesday, May 16, 2018 from 6:00 PM to 7:00 PM at Simpson Funeral Home in Webb City. The funeral service will be held on Thursday, May 17, 2018 at 10:00 AM at the Jesus Name Gospel Church on County Road 215 in Oronogo with Pastor Jarod Jones, Minister Tim Ryan, and Pastor Michael Alley officiating. Burial will follow in Carterville Cemetery. Services are under the direction of Simpson Funeral Home in Webb City. Visit www.simpsonfh.com for online condolences. To send flowers or a remembrance gift to the family of Emma Jane Ryan, please visit our Tribute Store. "Email Address" would like to share the life celebration of Emma Jane Ryan. Click on the "link" to go to share a favorite memory or leave a condolence message for the family.